Too bad that implementing efficient querying of a graph-based RDF model (i.e. mapping from SPARQL) onto SQL queries is difficult :) I’ve tried running Jena SDB on top of MySQL but it was too slow, so now we use TDB which is native. The code in handle_connections_sockets() (and mysqld.cc as a whole) is a good example of how not to write code. 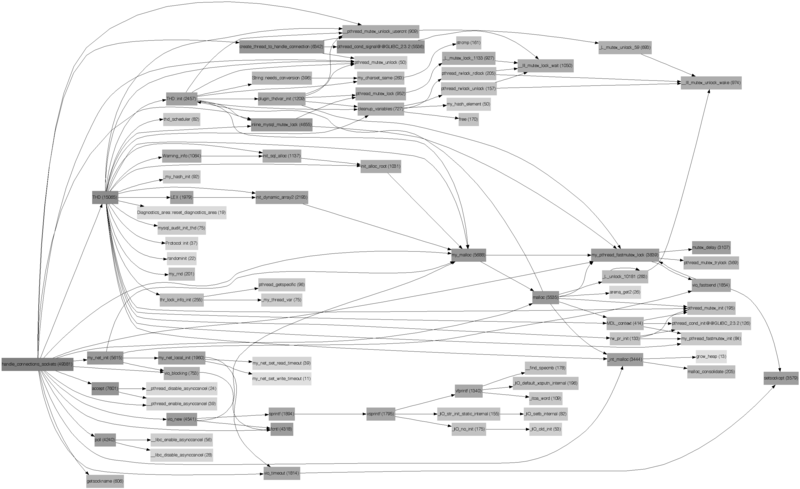 Network related code in MySQL is a absolute mess. For staters, one needs to take this function apart, move it to a more appropriate layer (no more poll/select mess), have a separate thread for each connection queue (or just have worker threads parked on accept()), etc. The non-blocking flag switch could probably be eliminated with accept4(). Just rewriting this stuff properly would eliminate a good chunk of this crap. It’s this kind of qualitative analysis that, as far as I’ve seen, is not only neglected in this industry, but actively suppressed because it’s not “simple”; in fact, it’s fast becoming a lost art. Thank you for breaking that trend and putting some real effort into discovering this. Domas, can you please elaborate some on how you use connection pools and for how long you expect a connection to last before you have to circulate it? Kristofer, what connection pools you have in mind? I was a bit wrong telling that LOCK_thread_count is less of a problem – it is at very core of this, as the “let’s pass job to other thread” design isn’t scalable. I was hoping you would recommend a client thread pool solution which helps amortize the authentication times. There are a few but it is still an open question to me on how they behave when some pressure is applied. In this case I think it was intended for those cases when load was beyond the scaling capabilities which usually led to a fast decrease in performance. With the “pass job to other thread” design the performance remained constant close to the max performance. The “passing to another thread” pattern relies on zero thread wakeup cost – which unfortunately is not the case – there’s relatively tiny fraction of time during which optimistic codepath can trigger – and there’s too much locking around to allow hitting it (probably worth instrumenting though, how many threads actually grab new task without going to sleep). I don’t understand what you mean by scaling capabilities etc – in a design where every thread is accepting (ala apache/multiple worker lighttpd/etc) you just eliminate a major chokepoint (as long as mutex holds are not too long overall). Current connection accepting code is so bad (it has way too high CPU cost component besides job passing) that it is difficult to hit ‘scalability’ issues at all. “scaling capabilities” : I mean that if you don’t limit the number of worker threads you will eventually get punished by their overhead and performance will decrease. If you limit the worker threads you still want to put incoming requests on a queue instead of discarding them to limbo. The passing of jobs in and out of this queue was considered a viable pattern to preserve through put performance on spikes (ie when your system isn’t able to scale). It is still unclear to me whether or not the penalty you pay per thread cancels the benefit of this strategy or where the limit goes. Certainly if you have enough capacity for more threads than the max possible number of connections you shouldn’t put anything on hold. Kristofer, technically now we don’t limit number of worker threads anyway (max_connections=10000 ;-) – though there has been some work with admission control in our branch. MySQL’s problem is not about not having enough worker threads to deal with requests, MySQL’s problem is that it cannot pass more jobs. Excellent analysis, and I’m definitely gonna steal the long-running version of PMP. I never tried to track down the root cause of this problem, but a few months ago I finally discovered why some of our requests were taking 3 seconds to complete. The default accept(2) backlog for MySQL (back_log in the config) is 50, which is way too low. This forces the kernel to discard incoming connection requests. Unfortunately, initRTO is hard-coded to 3 seconds (compile-time constant) – although I recently got the kernel to lower initRTO to 1 second (the first release with the change was v3.1-rc1). So in the end of the day, for those who are looking for a quick workaround without touching what version of MySQL they run, increasing back_log is the only way to avoid the dreaded 3s penalty. Unfortunately changing this setting requires restarting MySQLd. Benoit, there’s not just that – kernels by default limit max backlog to 128 too (somaxconn parameter) – so you have to bump it too. But yes, backlog is one of first things to change on busy systems. I will look into it more thoroughly and see if we can come up with something concrete.